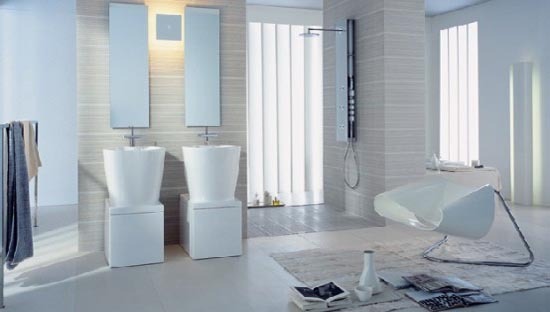 Last Friday, I attended an event hosted by Hansgrohe where they introduced some of the latest designs to their Axor line and gave some background about the designers who have provided so much of the inspiration. The international team of All-Stars is comprised of Philippe Starck, Antonio Citterio, Jean-Marie Massaud, Patricia Urquiola, Ronan and Erwan Bouroullec and Pheonix Design (Tom Schonherr and Andreas Haug). It was really a cool presentation, yet, it caused me to stop and reflect on the way that we are currently designing our bathroom spaces. Even though we were reviewing the creations of six different design firms, they were all building on the same concepts. Here are some of my take-aways from the day. First and foremost, lets just throw the typical floorplan layouts right out the window. This is awesome to me, because, so often we find ourselves allocating the same size “box” to the design of the bathroom. Here, it is like they had a blank slate to work with and that they just let the flow of the room unfold as it may. Now – this is a space that is totally re-defined. I’m not sure that I would have had the guts to incorporate such a massive window wall like they have, but it is definitely cool. One thing you will also notice as a constant theme with all of the designers is the use of the petition wall. This is such a simple technique, yet, it usually produces a very memorable effect. Next, they were all working off of the concepts of fire, water and earth. Which I get. These have been around for a long time, but, it appears that they are finally starting to gain recognition / appreciation. Check this out though. 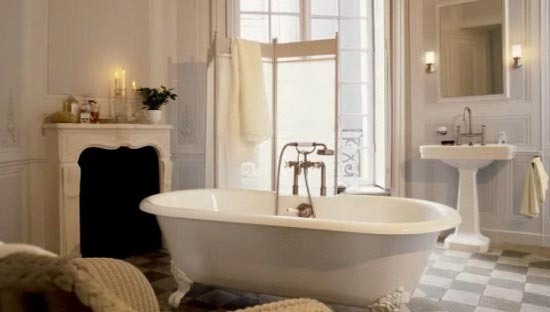 Do you notice the empty frames sitting behind the tub. These are meant to represent memories yet to come. Pretty cool, huh. Now, lets see if you can pick up on the common thread with these. Did you figure it out? It’s the seating for reading. 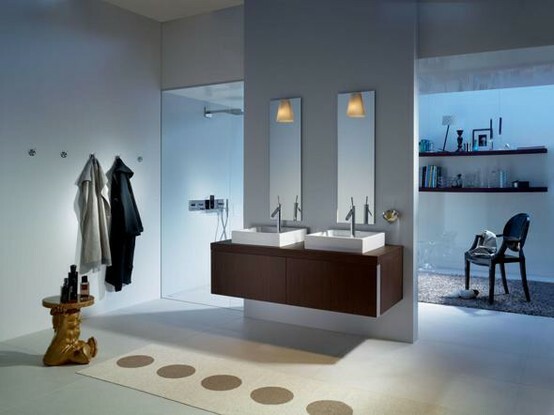 The premise is that the bathroom is changing from a place of hygiene to a place of living. A place for relaxation and well-being. Certainly, a place where one can replenish one’s soul. With that said, we should probably give it some more thought when composing. How about the theme in this group of images. Yep, absolutely -0- room for storage. This is the element that challenged me the most. You may have figured it out that I am on an anti-clutter kick these days, but, I’m still trying to wrap my mind around how this will work. One of the designers said that in reality we only use about 5 or 6 of the items in our drawer on a regular basis. In fact, most of the stuff in there just sits around for years and years. I have to say, there is a lot of truth to this. He felt that we should take our commonly used pieces and treat them like tools, setting them out where one can easily access them at any given moment. When designing, do you think we would have the courage to convince our clients that they truly do not require all of those extra cabinets. Sorry, but I think I would definitely have to have a linen closet tucked in around the corner somewhere. This one, I am absolutely on board with. Can you guess? Shower glass right. If you ask me, we’ve been building the same ole frameless shower enclosures for about fifteen years now. And before that, we were building the same ole shower enclosures, only framed. I think we can raise the bar a bit. I’d love to see us start incorporating some more open showers. If not the completely boundaryless approach, why not the walk in shower style like what’s in the second to last photo. The options are simply endless. 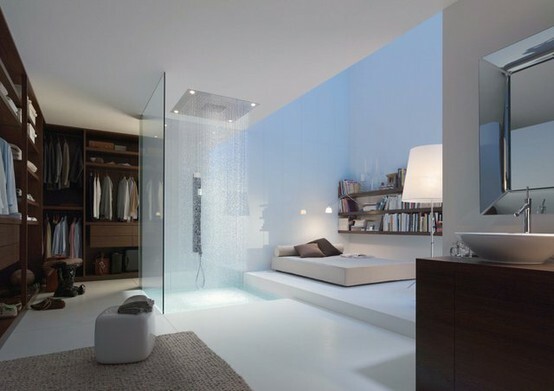 I’m not sure I would place a bed right next to the shower as in the this last photo, but, I think its very cool how they dropped the shower floor to help contain the space. So what do you think? 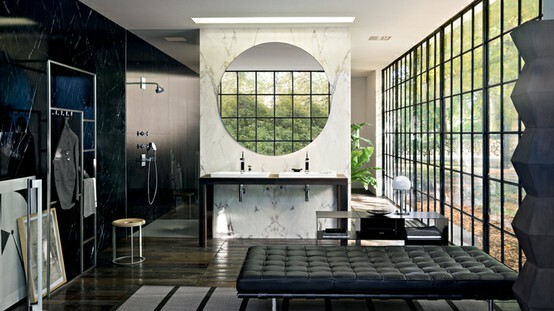 I know some of you guys are much more astute than I am to the finer details that go into creating a fabulous bathroom. Would you like to see us, as an industry, start to move in this direction? If so, I’d say lets break the mold and go build something that is truly exceptional! I’d love to hear your opinions, feel free to comment away. 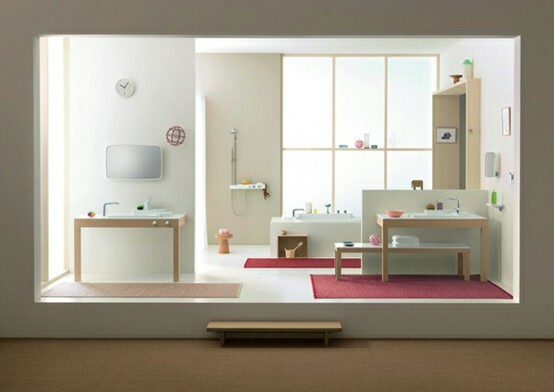 I’d like to order the Hansgrohe bathroom in the first picture please, the one with the metal windows. I have a thing about showers and I’m not enjoying many of the new open designs one reason: You should be able to have some privacy in the shower, right? There are some rather undignified moments you don’t always want to share even with a loved one. These are my shower requirements if you can get them: 1. Window to the outside, 2. Open so you can see out but with enough wall to preserve privacy when you want. 3. No shower door. 4. Able to turn on the water without reaching or getting wet. 5 Able to get out of the water flow while you are in the shower. 6.Color and finishes so you can tell that it’s clean. 7. You should feel outdoors rather than in a closet. Great list Terry. I agree 100% in maintaining some privacy in the shower, but, I think the trick for me is to find a happy balance. For my next personal bath, I think I will lose the shower door. Maybe do something cool with the glass I do incorporate. Utiliize a petition wall to some degree. Make it a walk-in. 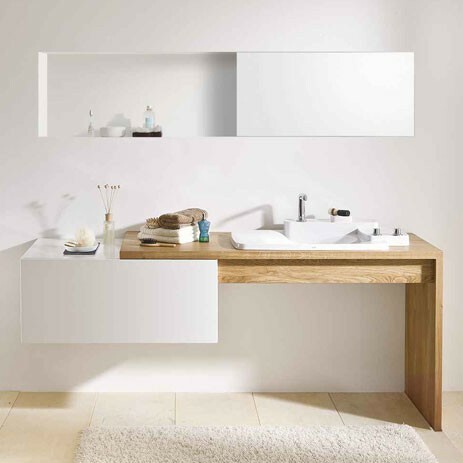 Then, I would want to have floating vanities. And, I would like to create a space for reading with a sleek chair and a place for books. 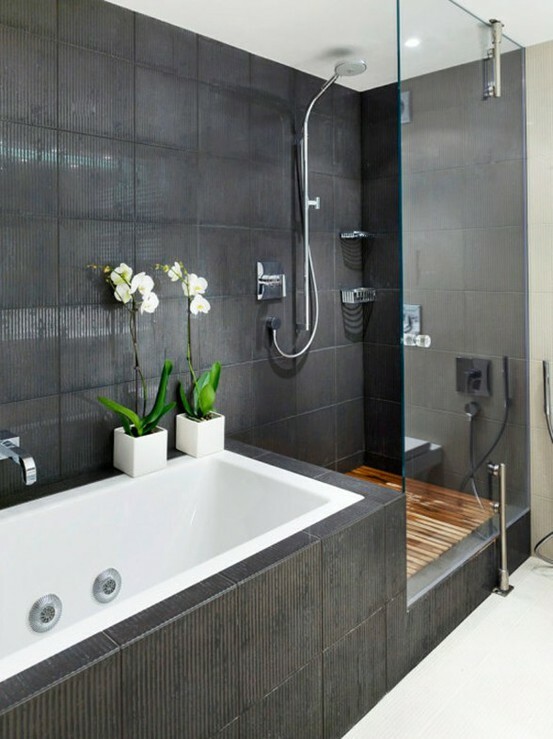 The La France Residence on the MA11 tour has one of the great showers. I dream about it. It’s “privacy” walls are at shoulder height so you can see over. You could see out of all the bathroom windows. It’s like being outdoors.